Want to give your business a little pep? Pique is the theme for you! 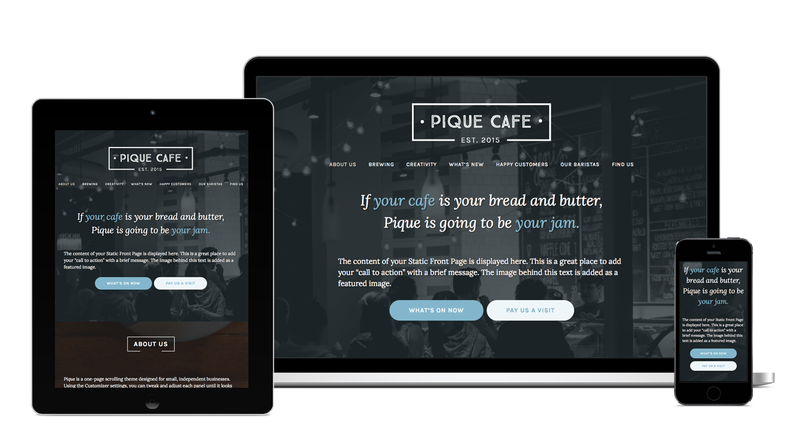 Designed to help you quickly build a one-page scrolling website, Pique is perfect for small businesses like cafés, bakeries, hair salons, and shops. 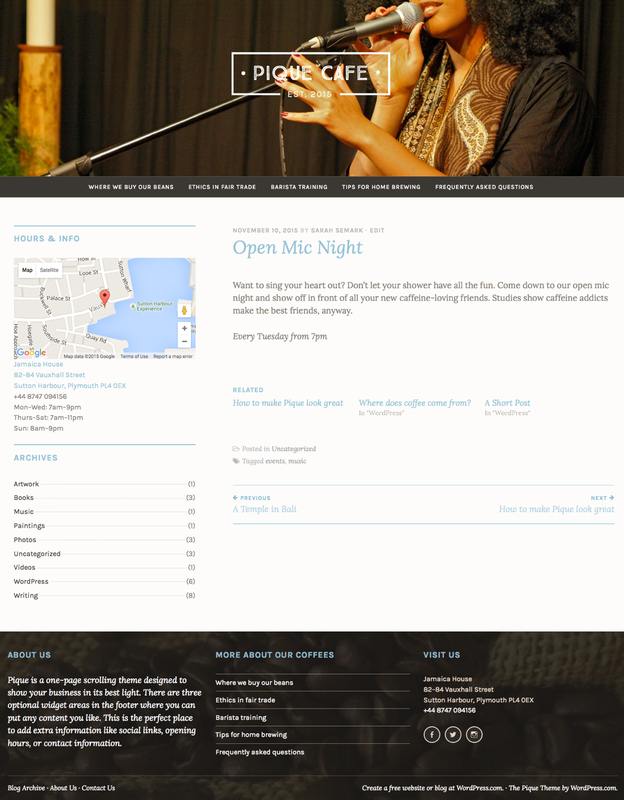 Single posts and pages use Featured Images in the header, and also feature a sidebar for additional widget content. When you first activate Pique, it will display your posts on the front page in a traditional blog format. Publish two pages – one to act as your Front page, and another for your Posts, if you would like to add a blog to your site. Select one of the pages you created in step one to display as the “Front page,” and choose the second page as “Posts page” to display your blog posts (if applicable). On its own, the page you assigned as your Static Front Page will display a single panel with a full-screen featured image, your site logo and/or title, your site menu, and your page content. The large, italicized heading that appears just below your menu comes from the first line(s) of text entered on the page you assigned as your front page. If you add a line break after your heading (by hitting ‘enter’ or ‘return’ on your keyboard), any additional text on your front page will be formatted in the normal paragraph font and size. To call out certain words in the headline in another color, simply italicize those words in your page editor. The color of the emphasized words will vary, depending on the color palette you choose in Customize → Colors & Backgrounds. To get the rest of your front page set up, you’ll want to add some more panels. Each “panel” is created from a standard page on your site. To set a background image for that panel, assign a Featured Image to the page. The ideal size for these images is at least 1400 pixels wide and 1000 pixels tall, since it stretches the full width of your site. You can also adjust the background color, and the opacity of your featured image on top of that color, allowing you fine-tuned control over your page’s appearance. The footer widget area uses your Custom Header Image as its background, which can be set in Customize → Header Image. Pique comes with several page templates built-in, designed to give you flexibility in arranging your content. To specify a page template, select it from the Page Options area, as you edit that page. The Grid Page template is designed to show child pages in a grid format — three in a row. This is useful for showcasing your services or featuring your staff. To get started, first create or edit a page, and assign it the Grid Page template under Page Options. The title and content of this page (if any) will be displayed above the grid. To add an item to the grid, create a second page and set its parent page as the grid page you just created. Be sure to set a Featured Image for each child page if you want an image to show up inside the grid. Repeat these steps for every item you want to display in the grid. Note: The Grid Template will display a maximum of 12 pages. The Full-Width template gives you more space for your content. It’s the perfect way to showcase a gallery of images or a video. 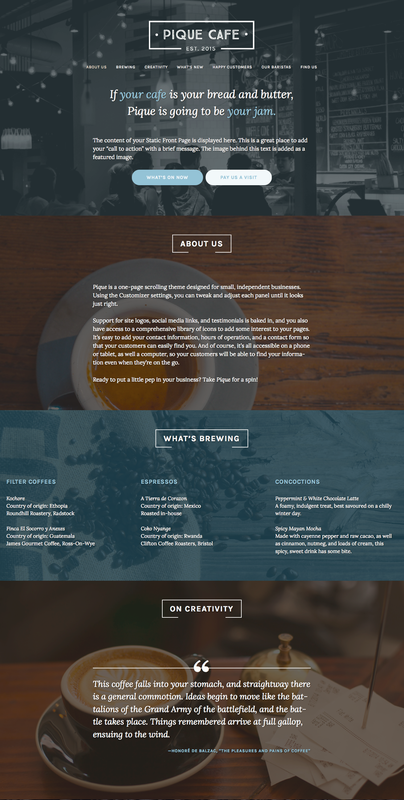 The Testimonials page template, that allows you to display testimonials as a panel on your Front Page. This panel will show two testimonials, selected at random. When the page is refreshed, two different testimonials will display, allowing your customers to see a rotating display of your testimonials. To add a testimonial, go to My Site → Testimonials → Add. Testimonials are composed of the testimonial text, the name of the customer (added as testimonial title), and an image or logo, which can be added as a Featured Image. You can show a panel of the three most recent blog posts by adding the page you selected as your “Posts page” as a panel. Pique comes packaged with the Font Awesome icon library so that you have easy access to hundreds of icons. To use an icon, find the icon you’re looking for on Font Awesome’s website and copy the code provided. To add icons, open any page or post for editing. Switch to the HTML tab in your editor and add the FontAwesome code where you’d like the icon to appear. Sometimes, you may want to show a smaller area of content with a solid background. 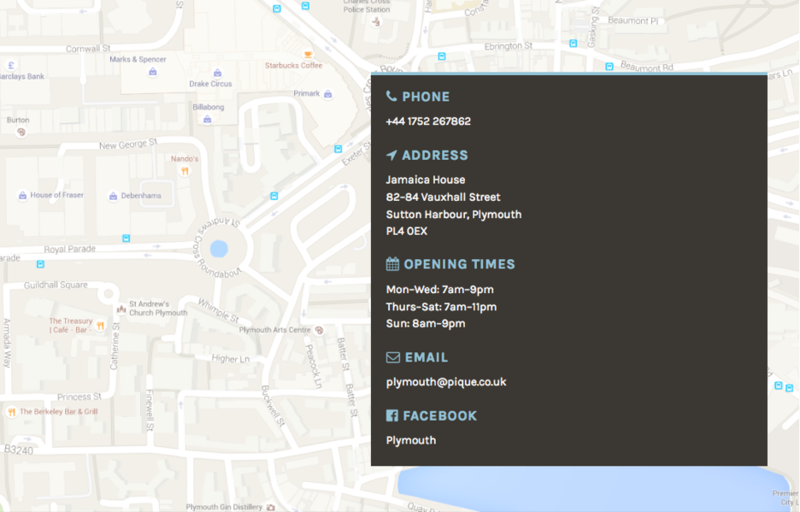 This is especially useful if you’d like to show a map in the background, with your content information overlaid on top. This overlay will be aligned to the right-hand side of its panel. You can add any content you'd like here. This works particularly nicely when combined with a Full-Width Template. Your logo is an important part of your brand identity, so Pique supports a Site Logo. To add your logo, go to Customize → Site Identity. Your logo will appear above the site navigation on every page. 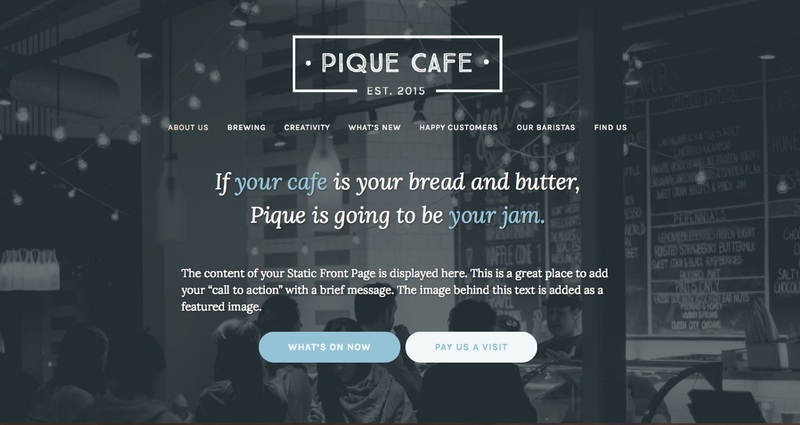 Pique allows you to have two Custom Menus: one in the theme’s header and one in the footer. Your front page can automatically show a menu with “jump” links, that will scroll down to your various panels. You can do this by navigating to Customize → Theme Options → Menu Settings and checking “Add an anchor menu to the front page..” Pique will then create that menu, for the front page only, that will link to each panel. 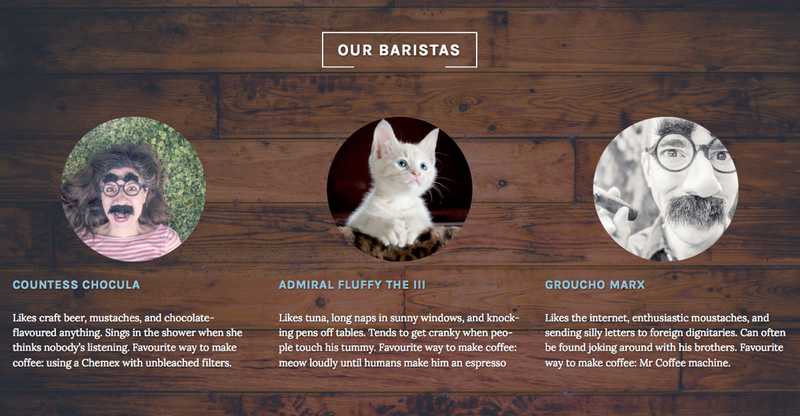 You can also create a Custom Menu that will display at the top of your site’s pages. If you selected the Dynamic Menu, as described in the previous section, the Primary Menu will appear on all pages except the front page. The Primary Menu will stick to the top for screen widths larger than 768 pixels (tablet size). Social links automatically display as icons. Pique doesn’t have a specific menu just for social media links, but it offers two excellent spots to put them. You can use a Social Media Icons Widget in one of the three footer widget areas, or you can use the secondary menu for your social media links. The main column width is up to 857. The optional sidebar is up to 408 wide. The recommended Featured Image size is at least 1400 by 1000. The theme will scale and crop the images depending on the page and device size. The recommended Custom Header image size is at least 1400 by 400. The Site Logo is a maximum of 100 high.